Now you will walk along another section of the old Historic Byram’s Ford Road and head over towards the main defense line on the Confederate center and left. 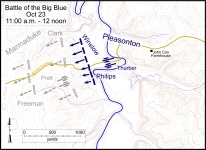 Walk north to retrace your steps to the Bloody Hill tour stop. Enter the woods and walk down the Bloody Hill path. When you get to the bottom of the hill, you want to turn left and follow the path up the hill to the north. After about 150 yards, the path turns to the left (west) right where you can see the back side of the Pepsi Beverages Co. bottling plant. Shortly after turning west, stop when you see a 4x4 post painted blue. 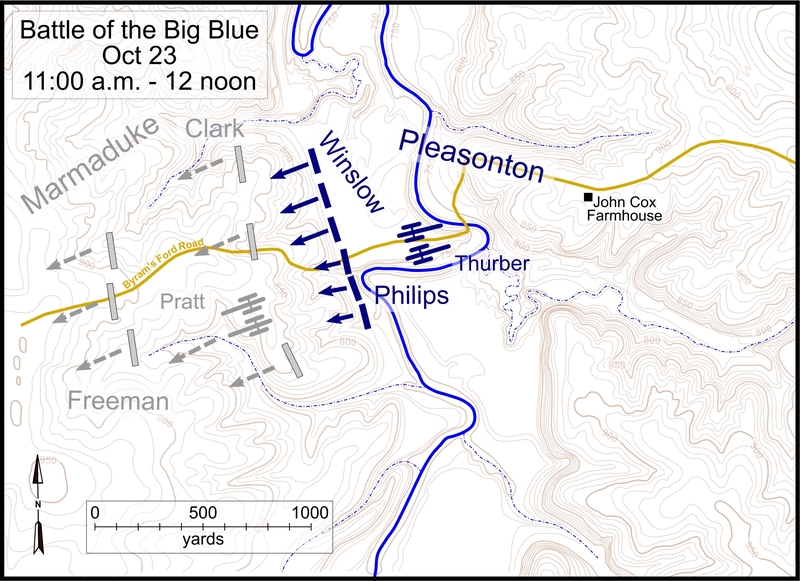 This post is Marker #9 from the original Big Blue Battlefield Walking Tour. 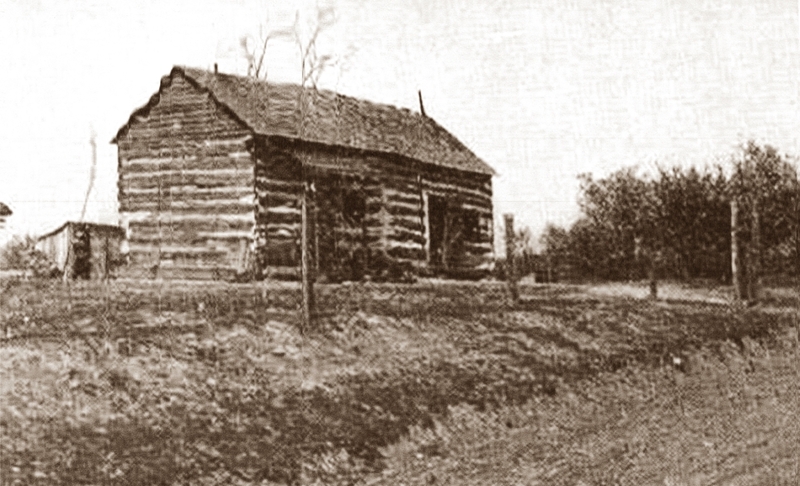 Located along the Byram’s Ford Road at this location was a log house used for cover by Confederate snipers. Byram’s Ford Road marker post 9 from original Big Blue Battlefield Walking Tour. Site of Log House looking east across Pepsi Beverages Co. buildings. 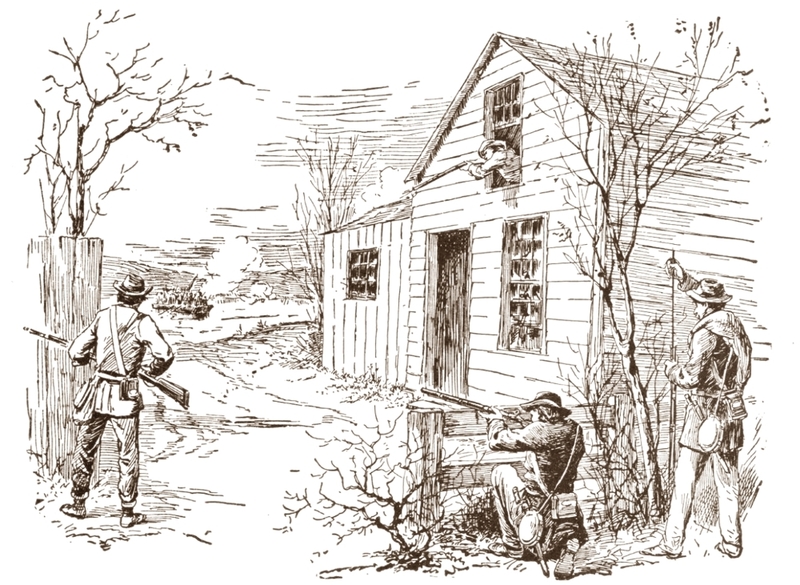 Bullet-riddled log house located along the Byram’s Ford Road (image from Battle of Westport by Jenkins). Confederate snipers using house for cover (from The Boys of '61 by Cof-fin).